Richard Vaughan established his first workshop as a designer/maker of furniture to commission in Sydney in 1983. He first exhibited in 1985 at the Sydney Opera House with the Woodworkers’ Association of NSW. He was later chairman of the Association and is an Honorary Life Member. He has exhibited regularly with the Association and in various other exhibitions. He was an inaugural director of Studio Woodworkers Australia. Richard’s work has appeared in journals in Australia and overseas including Fine Woodworking, Furniture, and Craft Arts International. He is represented in the Lark publication ‘500 Tables’, published in 2009 and the Taunton publication ‘Blanket Chests’ published in 2011. He’s been writing regularly for Australian Wood Review since 1996 and is proud to be a contributing editor of that excellent magazine. He also runs classes in fine woodwork in his workshop two nights a week. Typically the students are people with “real jobs”, at desks, who crave tangible expression and tell him he doesn’t know how lucky he is. In March - April 2009 Richard was a guest teacher at Center for Furniture Craftsmanship in Maine. 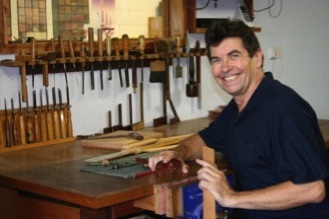 From 2004 to 2008 his seminars were a regular part of the Timber and Working with Wood Shows in the eastern states of Australia and 2009 saw his first appearance at the WA Wood Show. 2010 was the last of 5 years as a panelist on the very popular ABC Television show New Inventors. January 2011 saw flood interrupting play when over 2 metres of water inundated all tools, machines, stock, work in progress etc. The rebuilding of the shedudio was dauntingly slow but would have been almost inconceivable without so much help from woodworking mates. In January 2016 he ran a course in making furniture without nails, screws or glue on the remote PNG island of Bundrou in support of friendsoframbutso.org They had no tools but the woodworking community donated ever so generously. He is now involved in a project to bring adequate sanitation to the region.